Every morning I weight myself. For tracking this data I want to add my weight to a database using my smartphone. To solve this problem a web app build with Python would be nice. 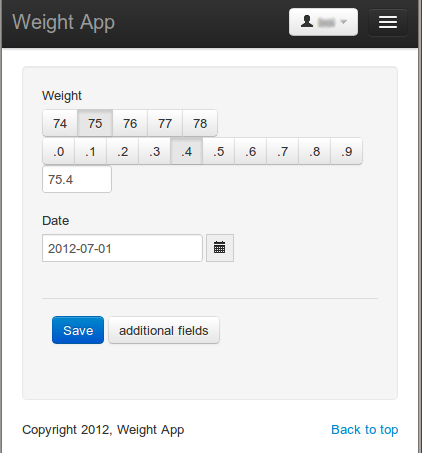 My solution is weight-app (fork it on github ) using Flask, Jinja, SQLAlchemy and bootstrap. The weight can be inserted by pressing only two buttons. Additionally there is a textfield for editing values not present as buttons. For a recurring task I wanted to read a key in the minibuffer of Emacs and insert data from a xml file using xpath. The version I use has to modify the data from the xml file using a jinja based template.